DRU Metro 200XT RCH. A spacious, spectacular gas fire. This fire belongs to the series DRU Metro gas fireplaces. 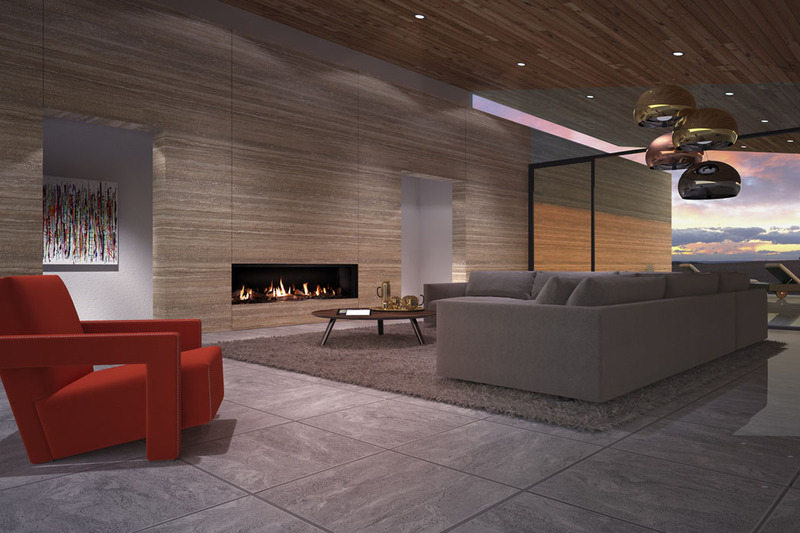 An extensive range of gas fireplaces with a wide panoramic view of the fire and unique features like Eco Wave, Clear View glass and Easy release door system. DRU Metro 200XT is a spacious 2 metre wide gas fire with a choice of fire beds in realistic logs, pebbles or stones. The interior backgrounds are available in smooth black or mirrored Ceraglass, for added visual impact. It also features the very latest DRU burner system, which generates high flames that dance around the logs or stones. It is also available in widths of 150, 130, 100 and 80cms. DRU is a modern company that continues to specialise in producing gas heating appliances. It is the largest producer of balanced flue gas fires and wall heaters in Europe and also produces wood and multi-fuel stoves and fires. In 1999 it relocated from its original home in Ulft to Duiven. The buildings in Ulft, which form part of our industrial heritage, have now been largely renovated and accommodate the “DRU factory” where culture and business come together. DRU has operations in 3 countries and a dealership network that spans Europe and beyond. On its 250th anniversary, DRU was awarded the prestigious designation of ‘Hofleverancier’ or a Supplier to the Royal Dutch Court. Founded in 1754, DRU is one of the oldest industrial companies in the Netherlands. Production of pots and pans of the time has stopped, but they have never lost their thirst for innovation and our sense of expertise. Over the years, DRU has become the standard in the field of gas stoves in Europe! This fire is part of the DRU Maestro fireplaces series. Maestro fires with unique features like Eco Wave, Dynamic Flame burner, Clear View glass and Easy release door system. Output net – G20 min. Output net – G20 max. At the Fire Place we specialize in gas fires, fire surrounds, electric fires and wood burning stoves. We offer a complete service, covering all aspects of installation, including free surveying. We primarily cover Staffordshire and the west midlands. With over 500 fires, fire surrounds and stoves you are sure to find one to match your dreams.